How to give each of your USB-UIRT's a different Name. 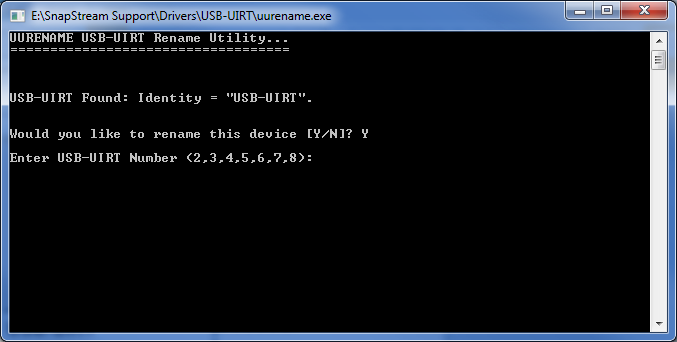 USB-UIRT's all have a default name of USB-UIRT. In order for our software to be able to tell each USB-UIRT apart, you will need to give each one a unique name (USB-UIRT, USB-UIRT-2, USB-UIRT-3, etc...). This article will show you how to burn a unique name into each of your USB-UIRT's. NOTE: If you purchased a SnapStream Server that came with IR blasting, this process has already been done for you. Label each of your USB-UIRT's. EXAMPLE: USB-UIRT, USB-UIRT-2, USB-UIRT-3, USB-UIRT-4, USB-UIRT-5. Connect the USB-UIRT labeled "USB-UIRT-2" to an available USB port, and install the driver if you are prompted. If you are using Windows XP, you can download the driver here: XP driver for USB-UIRT. Now run the USB-UIRT Naming Utility (UURename.exe). Make sure that only a single USB-UIRT is connected. The naming process can only be done one USB-UIRT at a time. You can also download this utility here: UURename.exe. Running the naming utility will bring up a command prompt windows. The first thing it will do is find the USB-UIRT and identify it's current name. In the screenshot above you will see the existing name in the Identity field. You will then see the following prompt: Would you like to rename this device [Y/N]? Hit the letter "Y" on your keyboard. Hit the number "2" on your keyboard followed by the enter key. NOTE: If you would like to test to make sure it was named correctly, you will need to disconnect and reconnect the USB-UIRT before running UURename.exe again in order to verify it's identity. Disconnect USB-UIRT-2, and connect USB-UIRT-3. Make sure that only a single USB-UIRT is connected. Repeat step 3 to name this UIRT according to the label. Continue steps 3 and 4 until all USB-UIRT's have had their respective names burned into them. Once all of the USB-UIRT's have had their names burned into them, you can connect them all to the server at the same time.